Tomorrow night is Yom Hashoah and I will be filing an appropriately somber article to Newsweek on the holocaust and the events in Syria in the last few days and years. But tonight a totally different sort of event was taking place here in Tel Aviv. 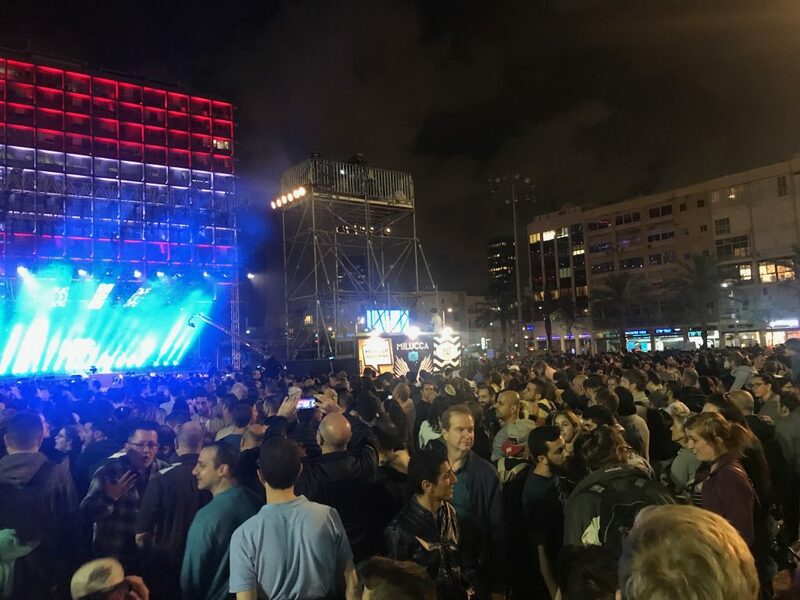 In Rabin Square, over 10,000 mostly young people (20’s and 30’s ) showed up for a unique show. A pre-Eurovision concert where representatives of 30 countries came to preview their songs that they will sing in two months at the Eurovision contest. Singers from throughout Europe and from Australia previewed their songs to an enthusiastic crowd. I am sure that many in the crowd imagined that they were standing in the middle of a city in Europe and not 40 miles from Gaza and 90 miles from the Syrian border. Events seem to be moving ever faster- As I write this post I am listening to Mark Zuckerberg testifying before the Senate, while my twitter feed just informed me that the Russians have vetoed a US proposal to create an independent commission to investigate the gas attacks in Syria. Iran today promised that it would retaliate for the alleged Israeli attack on an Iranian base in Syria, in which a significant number of Iranians were killed. It would seem that the Iranian installation that was attacked was significant and the attack was very successful. Israel is taking the Iranian threat seriously and is preparing accordingly. Tonight Ehud Barak was interviewed on the news. He somberly stated that while in his opinion at any given time there is a 1% chance that a miscalculation could bring about a full-scale war, recent events have brought that number to 10%, something that he thought was way too high. Barak stated that while the army was ready for a potential war, the country as a whole is not. So here we are a week before Israel’s 70th anniversary, and on one hand, we celebrate our success and reach out as part of the larger world community. At the same time, it’s becoming clear that there exists a very real possibility that war is a very real possibility. The Druze Rally- What does it mean? Was tonights rally a start of something bigger or not? Laurie on Why I Care! Natalie Veyvoda on Why I Care! Laurie on Was tonights rally a start of something bigger or not?